I have to say that this book grabbed me from the beginning chapter to the last page. I love anything Elizabethan and after reading the first chapter that was dated March 20 1555 by a man, Rufus Hatton, physician to Elizabeth I. What intrigued me about that first chapter was the fact that Queen Elizabeth I gave birth to a son. Of course historians would probably disagree but what if? I don't think that it could not have been possible. Her lack of wanting to marry might just be what was stated in the book, she had a hard delivery and never wanted to go through that again. Knowing that if she had married that she would be obligated to produce an heir, makes sense to me. Of course it probably never happened. 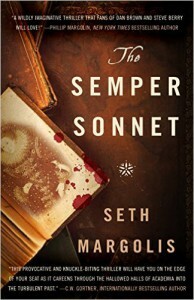 The real story of the book though is about a woman, Lee Nicholson who has discovered a sonnet, written by Shakespeare and this sonnet holds a secret that if unleashed upon the world would be devastating. After Lee has an evening with a man, goes to get coffee and comes back to this man dead in her bed. She had read the poem on the air of a radio broadcast the evening before. She is interrogated by the police and her story to them does not sound plausible and she turns out to be a suspect in this murder. She wants to figure out what happened and she ends up on the run, staying one step ahead of the people that want that sonnet, for what secrets it holds. She narrowly escapes with her life as she desperately tries to find the information needed to exonerate herself. This book is a thriller at it's best. Like I said, I was taken in by the story from, page one. The story goes back and forth from Tudor England to present, from a diary written by a man who was privy to the secrets in the sonnet to a young woman on the run, trying to stay one step ahead of the people out to get the sonnet one way or another. If you like historical fiction, Tudor England and thrillers, this one is definitely for you. I loved it and give it 5 stars!! Congrats to the author for a well written, thrilling book!